Pre-heat your oven to 180c. On a baking tray lined with non-stick baking paper place the tomatoes that have been lightly dressed in a small amount of olive oil and seasoned. Bake in the oven for approx 50mins to 1 hour. They should be slightly caramalised. To prepare the remaining vegetables, slice the zucchini on an angle making each slice approx 1/2 cm wide. Dress lightly in olive oil and seasoning just before placing on the BBQ. For the asparagus remove the woody ends and cut the asparagus into bite sized lengths if you prefer. Dress lightly with some olive oil and seasoning. Cut the cheese into small bite sized pieces approx 1cm thick and no more than 2cm in diameter. Heat your BBQ. Grill the vegetables until they have a lovely caramalisation and then also the cheese taking care not to burn them. Place all the ingredients into a bowl. Add the roasted tomatoes, the rocket and combine well. Place on a large plate and serve warm, or at room temperature. 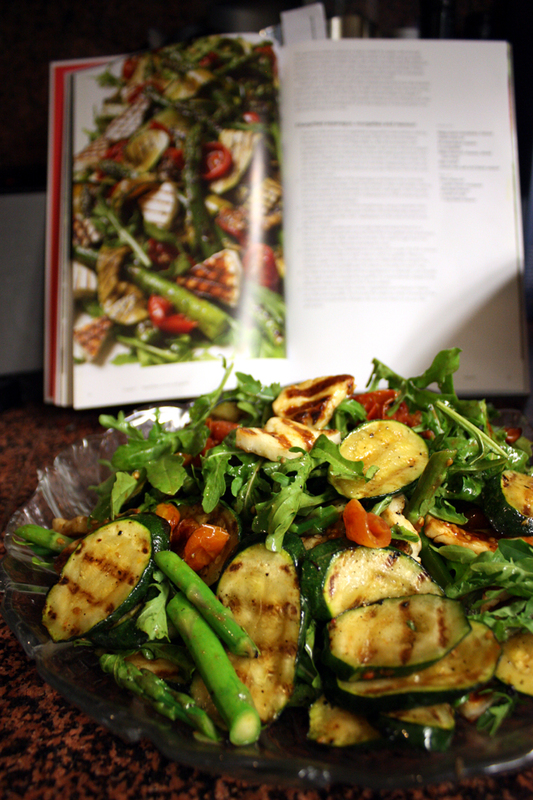 Just before serving, drizzle the salad generously with the basil oil. To make the basil oil, place all the ingredients into a food processor and blitz until well combined and the basil leaves and garlic have been pureed. This will keep in a sealed jar in your fridge for up to a week.